Swanson ash and granite vase - 6½" (165 mm) high. 2003. Peter Swanson was born in 1950 in Dartford, Kent. When he was a toddler his family, who were potters, moved to Hampshire, and then again when he was twenty-four they moved to St Ives in Cornwall. They operated the Barrie Alexander Pottery (Barrie Alexander being the first two names of Peter's elder brother) as a family business, making slip cast wares for sale mainly through London stores. The pottery specialized in animal models and decorative items, and had thirty-five employees. In 1976, Peter started working on his own, first at Breage, then Tresowes, and finally at his present location of Rosudgeon on the A394 - the Penzance to Helston road. 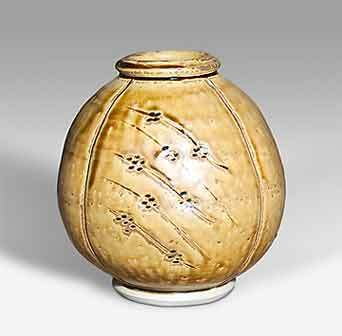 Peter works in the Anglo-Oriental style favoured by many Cornish potters, and produces his own ash glazes which he uses over his own body clay made from local materials. He has three kilns - one electric, of 25 cu ft capacity for biscuit firing, and two gas fired. The smaller gas kiln, of 12 cu ft, is used for plates, and the larger, which Peter built himself, is around 34 cu ft in capacity, with an arched roof. He uses this kiln for his reduction glaze firings. Peter's work is sold mainly through well established galleries, including St Ives Ceramics, Bettles, and Cobra and Bellamy in London's fashionable Sloane Street. Peter's younger brother, Tony, runs a Alicium Ceramics which operates on similar lines to Barrie Alexander, in nearby St Erth Praze, with the help of their mother, who decorates the wares.